Mastitis is an unpleasant disease which is endemic throughout dairy herds in the UK and around the world. The disease causes the swelling of the cow’s udder tissue and mammary glands, making this not only uncomfortable for the cow, but very costly for the farmer both in treatment and profit loss. Clinical cases of this disease are where the animals have clear and undisputed symptoms. These can sometimes be acute and affect a previously healthy cow very quickly or they may be the most commonly seen symptoms (sub-acute), where symptoms are mild and may only affect the cow in a marginal way. The most common mastitis symptoms can be found in changes to the udder, perhaps it is swollen, red or hard and it may be abnormally hot. The milk being produced by the cow may contain clots, flakes and pus and may be watery in appearance. 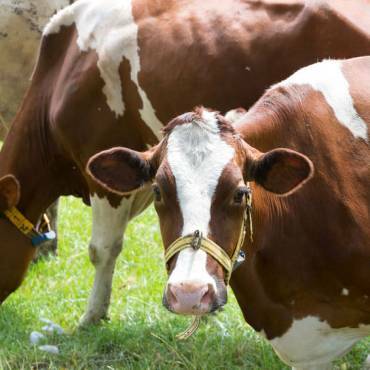 If the disease is particularly systemic and is severe, other mastitis symptoms that may be present include a loss of appetite and an increase in body temperature. The cow may have sunken eyes, diarrhoea and be dehydrated. The animal may be experiencing pain caused by a swollen udder which may cause her to become immobile. Changes to the udder, such as the heat and redness are the result of the animal’s immune system trying to fight the mastitis infection. An increase in white blood cell production to fight infection also caused the swelling of the udder tissue. In mild cases, the cow’s own immune system may be sufficient to fight the disease. For mild cases of infection, the recommended mastitis treatment will be a course of antibiotics via the intramammary tube, and also systemic treatments either subcutaneous or intramuscular. Systemic antibiotics should be used when the animal is ill, when udder changes are obvious and when more than one quarter is showing signs of infection. Antibiotic treatment plans should be discussed with your own vet to ensure that the correct treatment regime is used. NSAIDS or non-steroidals, reduce the pain and swelling in cows and are aspirin-like. They were used in severe cases but evidence is now coming through to indicate that they may also have a place in treating milder forms of infection. Animals treated with NSAIDS and intramammary antibiotics have shown better recovery and fertility rates. It is known that many factors on a dairy farm can influence the spread of mastitis through a dairy herd and there are numerous simple and effective preventative measures that can be taken, many concerned with hygiene on the farm. Housing should be kept clean to ensure that pathogens responsible for the disease are not given an environment in which to thrive. Udders and teats should be kept clean and this can be helped by encouraging good handling techniques. These include keeping pathways to the milking area clean and ensuring that the animals are moved slowly to reduce soiling. In the milking parlour itself, good routines can reduce the incidence of infection. Machinery should be well maintained and kept clean and the installation of new milking equipment can also aid in reducing the spread of disease. 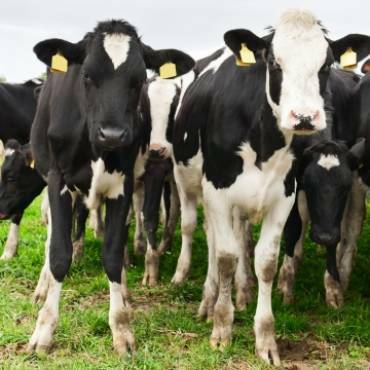 The effects of mastitis can have far-reaching economic impacts on dairy farmers, from the reduction in milk yields and in some cases, the milk being unsaleable, to the high veterinary costs in implementing a treatment strategy within a herd. Prevention and early mastitis detection really are key in reducing the incidence of this disease in UK dairy herds.